Leyte, Philippine Islands, 20 October 1944. 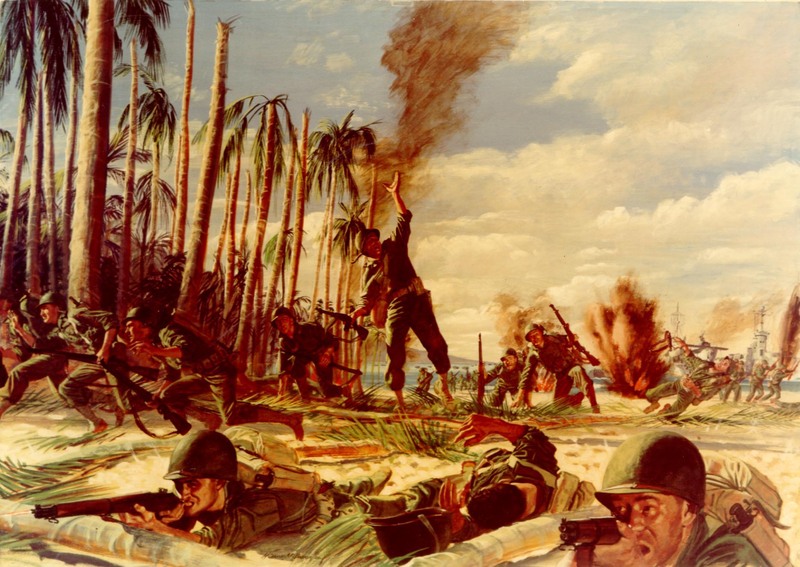 The American Army returned to the Philippines over the beaches of Leyte Island. Red Beach was defended by the Japanese occupying a number of large, well-camouflaged pillboxes. Immediately after their landing, the leading elements of the 3d Battalion, 34th Infantry - one of the units of the U.S. Army's 24th Division - were pinned down by heavy machine gun and rifle fire. The Regimental Commander, Colonel Aubrey S. Newman, arrived on the beach and, taking in the situation at a glance, shouted to his men: "Get up and get moving! Follow me!" News of the success of the American Forces in establishing a beachhead on Leyte - the first foothold in the Philippine Islands - was joyfully received by the American nation. The President radioed congratulations to General MacArthur and added, "You have the nation's gratitude and the nation's prayers for success as you and your men fight your way back ......"